Aquaponics has emerged as an increasingly popular food production method. 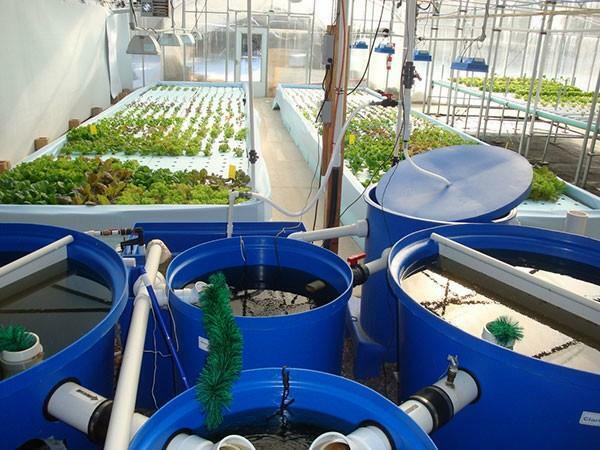 A basic aquaponics setup combines fish farming with hydroponic agricultural farming. Hydroponic agriculture refers to growing plants without soil, instead using nutrient enriched water. By combining hydroponics with fish farming, food producers can increase their output, create a sustainable farming system, and maximize space usage. However, Aquaponics system design is complicated by the widely different needs of both plants and fish. When aquaponic fish farming is combined with hydroponics to create a well-designed aquaponics system, both plants and fish can coexist in a balanced microcosmic ecosystem. It’s even possible to build a near closed loop aquaponics system that is largely self-sustaining. The fish will eat algae and plant waste. The fish then excrete waste, including ammonia. Bacteria then convert the ammonia into nitrogen in the form of nitrate ion. If the ammonia were allowed to accumulate, it could prove fatal for the fish. Instead, it is converted into nutrients. The nitrogen (nitrate ion) can then be used as a fertilizer for the hydroponic plants, thus creating a self-contained ecosystem. Throughout this process, pH levels will rise and fall as acids and alkalines are produced. Other potentially deadly substances, such as nitrite (NO2), are created. If these factors are not closely monitored, the delicate balance could quickly be upset. As a result, the efficient but relatively fragile aquaponics system could crash. Water chemistry requirements are especially difficult to balance. First, a proper water source must be identified. After all, a painting can only be as good as its canvas. As such, even a basic aquaponics setup must be supplied with good water. However, even the best source water will not ensure a proper balance between the hydroponic needs of the plants and the needs of aquaponic fish farming. Good aquaponics system plans will include frequent testing. When first building and implementing your aquaponic system, daily testing should be conducted. Dissolved oxygen, pH levels, conductivity or total dissolved solids, ammonium ion (NH4+), and nitrate ion (NO3-) must all be closely monitored. As you set up your aquaponics system, you should make daily adjustments until achieving the desired results. Once a balance has been achieved, you can cut testing back. However, aquaponics systems should be tested at least once a week. More frequent testing is often recommended. It’s important to keep an eye on dissolved oxygen, pH levels, dissolved solids, and other factors. If one element is out of sync, the entire system could be threatened. If you do not react quickly enough, both plants and fish could be harmed. On the other hand, if the problem is identified early on, it may be possible to address it with relative ease. Consider dissolved oxygen, for instance. Oxygen levels are extremely important for fish. If oxygen levels are not optimized, fish could suffer from slowed growth and are more likely to perish. Oxygen levels are also important for nitrifying bacteria, which in turn are essential for converting fish waste into needed plant nutrients. Improper oxygen levels could thus hurt both fish and plants. A fully closed loop aquaponic system may not be possible as pH levels, dissolved oxygen, dissolved solids, and other factors must often be adjusted. However, a well-designed and implemented aquaponics system can be very efficient. When combined with appropriate monitoring, it is possible to grow both fish and plants efficiently. A well-designed hydroponics and aquaponics system will usually require only minor tweaks. The balance between fish, bacteria, and plants is delicate. However, balancing this system is relatively easy if you constantly monitor conditions and react quickly when needed. For example, if ammonia levels are too high, cutting back on fish feed will reduce ammonia output. If ammonia levels are too low, you can add more fish to the aquaponic system. Likewise, low pH levels can easily be adjusted with base additives. However, you need to know the exact pH levels while making adjustments. In order to make these adjustments, you must know what is actually going on. “Eye-balling” it is simply not good enough. You need to constantly monitor your aquaponics system with the right equipment, including pH sensors, dissolved oxygen sensors, and conductivity sensors. If and when the system appears to become unbalanced, the quicker you make adjustments, the lower the risks will be. Thanks for your feedback. Please feel free to share this post with others via social media! I got a chance to work with the aquaponic system and it’s amazing to see healthy plants growing through it. Thanks for sharing this insightful blog. It will certainly help the new user.